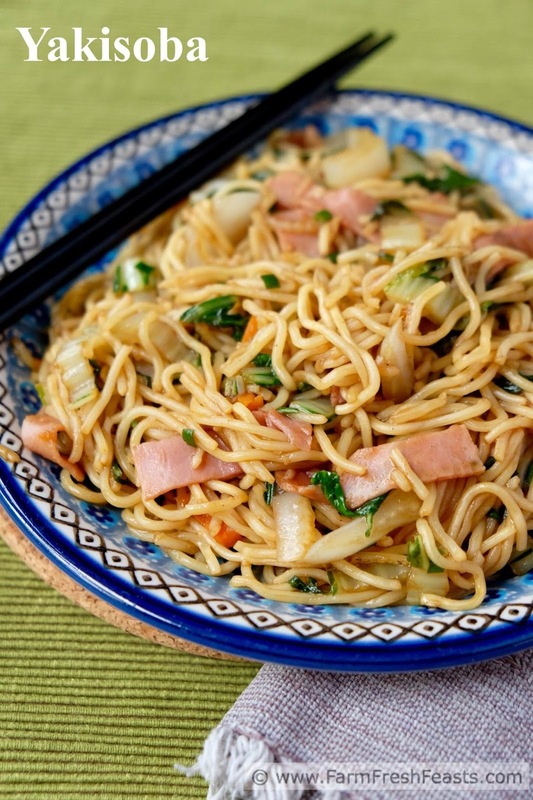 Recipe for vegetables and meat tossed with noodles and sauce for a kid friendly Japanese dish. If you wander through an outdoor festival in Japan, you can see women fixing a delicious stir fried noodle dish, yakisoba, on giant flat griddles. 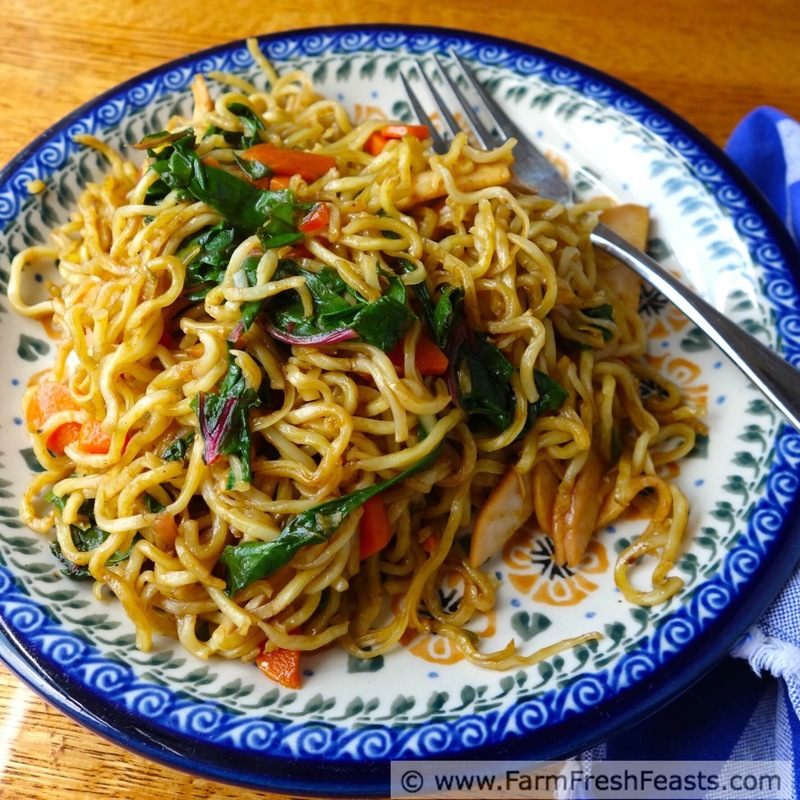 Because of these unwitting cooking demonstrations, yakisoba is one of the Japanese dishes I'm comfortable making. I originally had celery in here, but decided there was enough crunch with the Bok Choy and Daikon. I'm pretty sure my kids developed a taste for it in utero, because they have loved it from the chicken nugget age. 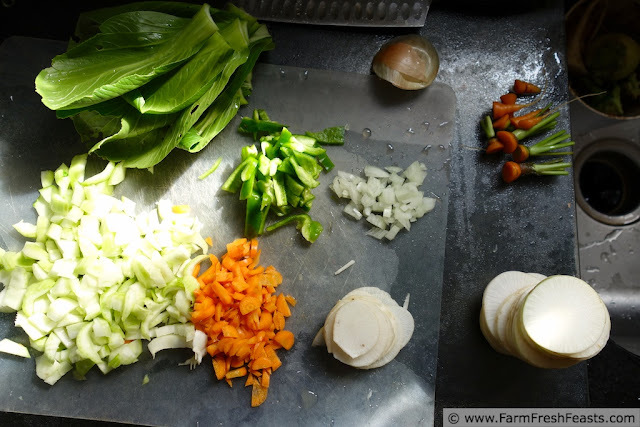 When I get the right mix of veggies in the farm share (some sort of cabbage, carrots, celery or pepper, and onion) it is their lunch of choice. Yes, my kids come home from school for lunch. At least my son is easily persuaded to join us if yakisoba is on the menu. Oh! Because it's Japanese, give equal emphasis to each syllable: yah-kee-so-bah. Easy! 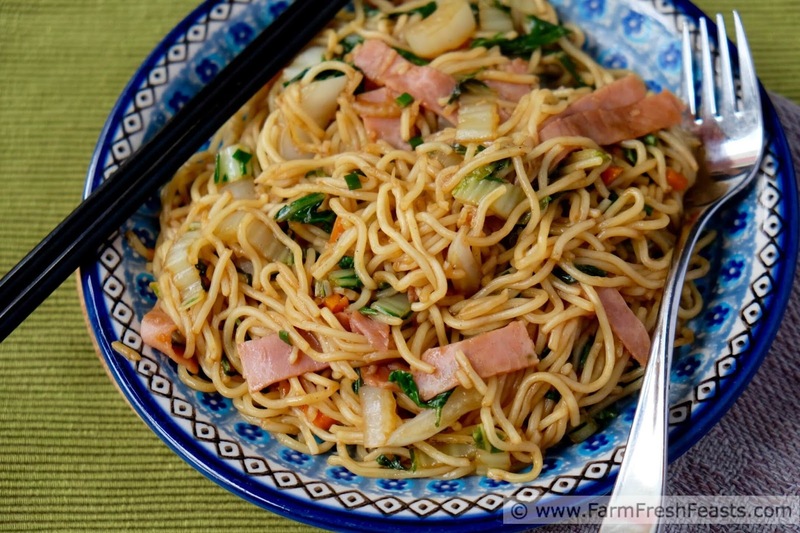 For more recipes using bok choy, please see my Bok Choy Recipes Collection. For more recipes using carrots, please see my Carrot Recipes collection. For more recipes using radishes, please see my Radish Recipes Collection. These collections are part of the Visual Recipe Index by Ingredient, a resource for folks like me starting at the contents of a big box of fresh farm share vegetables and wondering how we're going to get the family to eat them. For more recipe ideas, follow me on Pinterest. For a peek at scenes of life, follow me on Instagram. For articles that caught my eye and epic failures because I have my share, follow me on Facebook. Want to know How to Use This Blog? Onion skin for the soup pack. There was surprisingly little that went out to the compost from this. 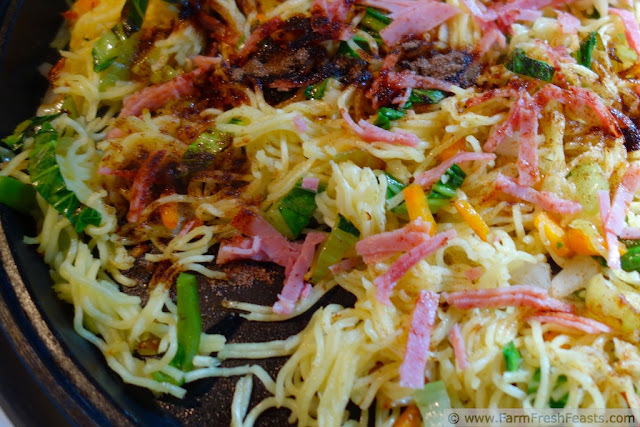 Preheat a wide flat electric skillet to 350 degrees Fahrenheit (on the stove, medium high heat). I like to use my thrift store giant electric skillet for this (and for pancakes and French toast and when the gas line to the new stove is not yet installed). You need room to toss everything around. I suppose a wok would do, too, but since the ladies in Japan were making this on a wide flat skillet, I do too. Though I lack their mad chopstick skillz. Add vegetable oil, one turn around the pan. Start the onions, Bok Choy stems, and carrots. Stir fry them 3 to 5 minutes until they are starting to soften. Add the Daikon and pepper. Continue to stir. After a couple more minutes, add the Bok Choy leaves and ham. Stir. 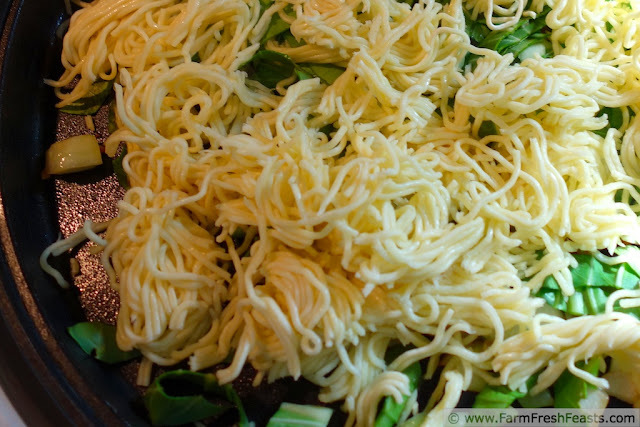 Break up the noodles over top of the veggies. Stir it all together for a few minutes. Sprinkle the spice packet over top. Add water according to package directions. Toss until everything is coated with the resulting sauce. This post joined the rest of the party at What's In The Box on In Her Chucks and the Wednesday Fresh Foods Link Up at Gastronomical Sovereignty. The sauce packet is sprinkled over top, ready for the water and tossing. I really want this for dinner tonight. It sounds so good! 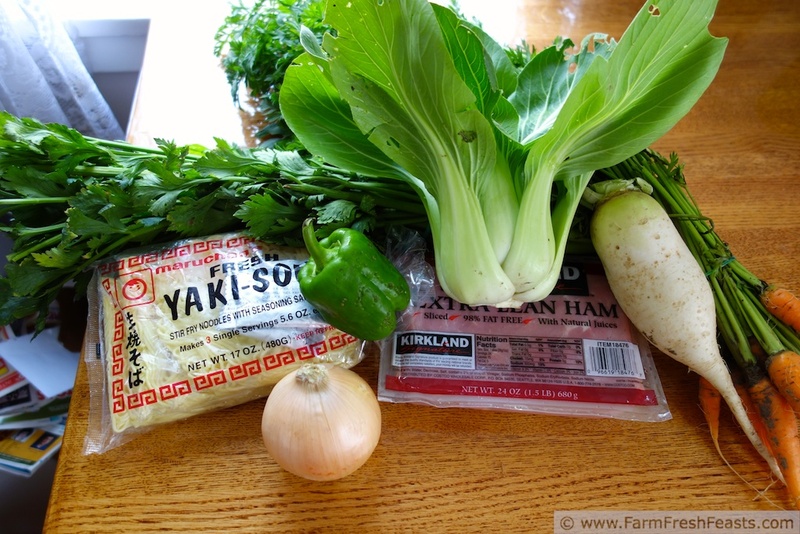 Hopefully I'll get bok choy and company from my next farm share on Monday. I hope you got bok choy! For the winter, my CSA has switched from weekly box pickups to biweekly deliveries (minimum order) so I'm in the new-to-me position of choosing which items I want in my box. It's weird. I'll let you know how it goes-starts this week. As do my kids, Heather, as do my kids. Made this for lunch this week, during exams, and there was fighting over the leftovers as usual. I've got a bit of Chinese cabbage left from last week's delivery and I'm thinking fried rice. Thanks for hosting! Since I'm all about eating from my farm share all year long, even though I only get deliveries during the (Ohio) growing season, I'm happy to join your party.